The Survival edge brings an economical survival knife that still offers the same high standard of cutting power. To complete this a Secure-Ex sheath is include to wield your tool and protect this fine blade when not in use. The 4 1/4" handle is crafted using a strong material known as Polypropylene. This is notorious for it's strength and reliability. 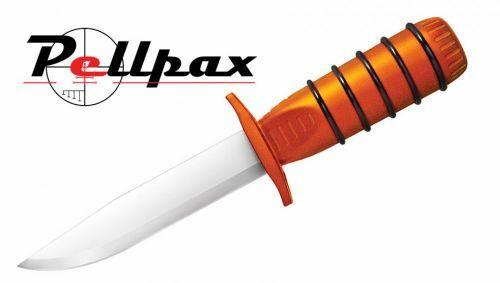 It also offers a strong yet comfortable grip allowing you to get the force behind the knife without worrying about the safety risks. The finger guard incorporated into the handles design prevents your hand and blade coming into contact giving you peace of mind. The 5" blade gives a good reach and deep penetration with devastating effects on the material. Made from the tough German 4116 Stainless steel the blade is durable and and effective. The Point will pierce tough material making it seem almost effortless. Overall a very good looking knife which gives you a high quality for a low price. Ideal for the survival enthusiast the knife incorporates many features for these situations. The Rubber O-rings on the handle provides a strong grip even in wet conditions. A few twists of the waterproof cap reveal the knife's hollow handle allowing storage of survival aids, small maps and other useful accessories. The sheath features a Ferrocerium fire steel which can be striked agasint the blade's spin producing a sprinkle of white sparks. Add this item to your basket & spend an extra £461.01 to apply for finance.